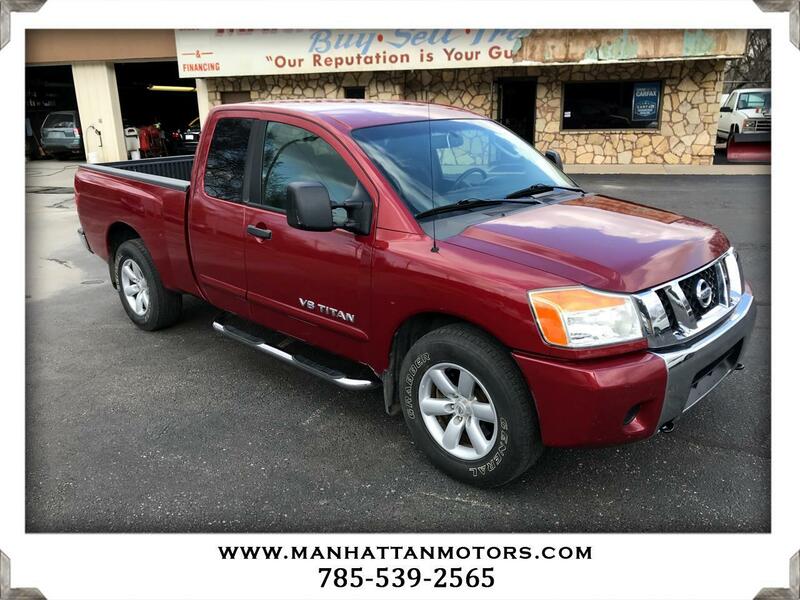 Our 2008 Nissan Titan SE w/FFV King Cab 4X2 in Red Brawn Metallic matches up well against the competition in terms of towing and hauling capability and excels in terms of design and road manners. Fueled by a 5.6 Liter V8 that offers 317hp while mated to a 5 Speed Automatic transmission. This Rear Wheel Drive is plenty powerful, and its suspension and steering make it fun to drive. The FFV designation lets you know it has a flex-fuel engine, which can add up to some nice savings for you at the pump. The exterior is enhanced by a chrome grille, chrome tubular side steps, rear privacy glass, a handy storage compartment behind the rear wheel, a sliding rear window, a bedliner, trailer hitch receiver, and prominent alloy wheels. This SE model has some features and upgrades that definitely give it an edge, such as keyless entry, full power accessories, comfortable cloth seating, a leather-wrapped steering wheel with mounted controls, a power driver seat, a fantastic audio system with an in-dash CD changer and an auxiliary audio input jack, air conditioning, and much more. The hinged rear door on our King Cab models swings back 168 degrees to create exceptionally convenient interior access, and the rear seats fold up to provide a large load floor for hauling items inside the cab. Nissan includes safety features such as ABS, the LATCH system, crumple zones, and dual front airbags. Bold and forward-thinking in its design, this Nissan Titan SE has a lot of typical big-pickup features and a lot of upscale amenities - the best of both worlds. Print this page and call us Now... We Know You Will Enjoy Your Test Drive Towards Ownership! Thanks for choosing Manhattan Motors. We recently won The Manhattan Mercury Readers' Choice Award for being the #1 Used Car Dealer. Buyers enjoy our "laid back" approach. No test drive routes or high-pressure salesmen. Our focus is to offer all of the information you need to help make the best decision for your family or business. Each one of our vehicles undergoes a 30-point vehicle inspection by Burnett Automotive, Manhattan's #1 Auto Service Facility. We are also the area's only Independent USAA Certified Dealer, offering discounts on purchases and interest rates.